Never entertain any suspicious emails or spam, especially when they ask you to download something, open something or click something. Always download apps from first-party sources or official app stores. By default Android will not allow for apps to be downloaded from any source other than the Google Play store; unless you know what you’re doing you should not change this setting. Always check the permissions an app asks for before granting it. If it’s too excessive, or if it places you in doubt, refuse. Install a security solution on your mobile device in order to safeguard against malware such as this. Aufgepasst! 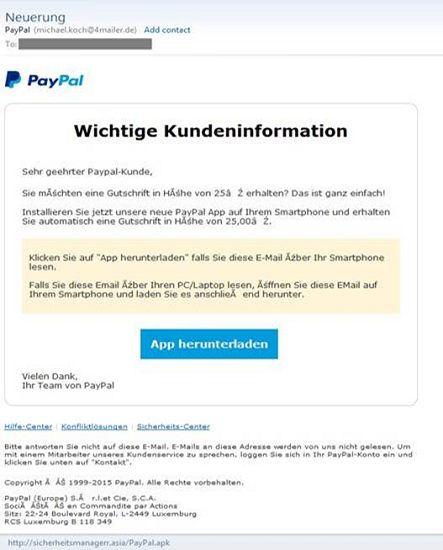 Auch wenn eine Mail vertrauenswürdig erscheint: Paypal schickt Euch solche Aufforderungen nicht, auch keine Bank oder Spasskasse!